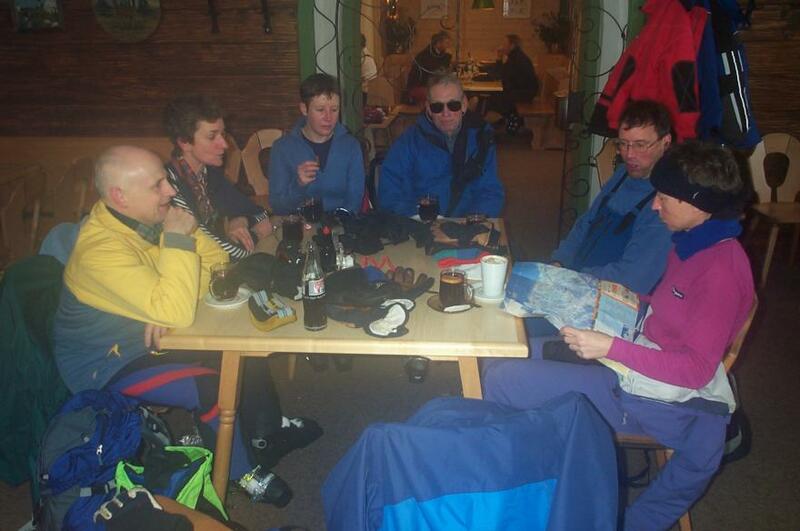 This year there was only eight of us in the ski group that has evolved from the Vibram Mountaineering Club. We had decided to forgo the pleasures of the snow-train to the French Alps and fly to Austria instead. 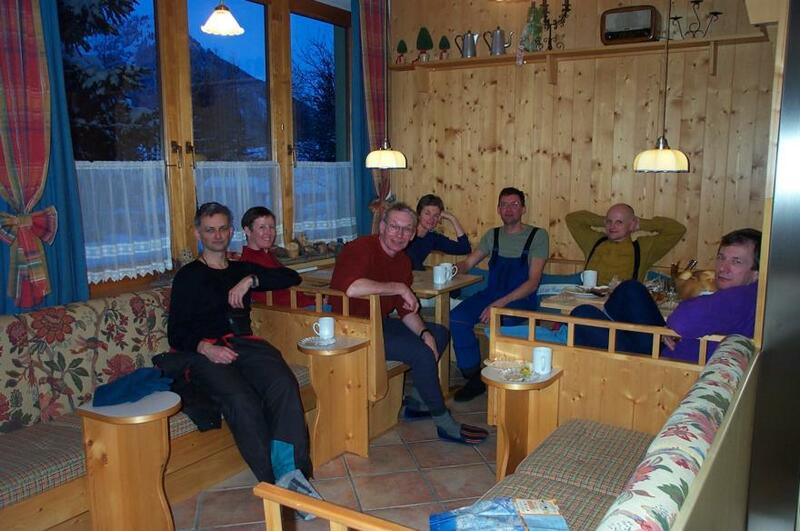 This time we travelled with Inghams and stayed in the Chalet Christophorus in St Anton in the Arlberg ski area. 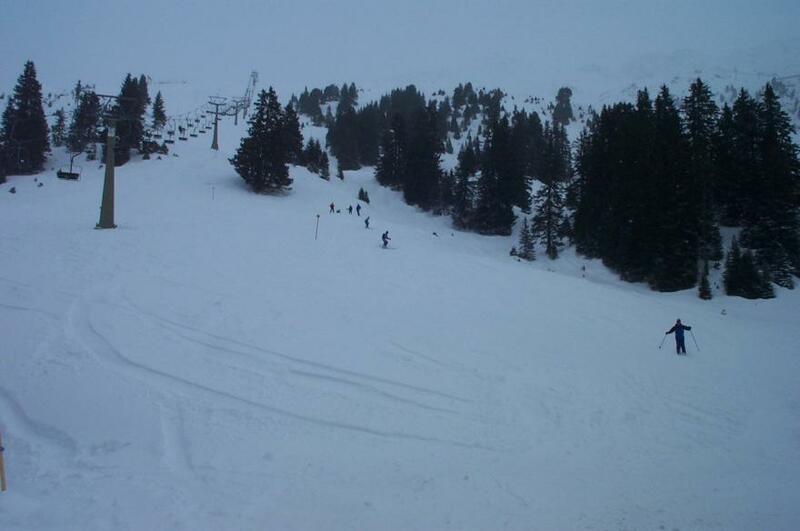 There are a some live webcams here and couple of interactive piste maps here - select the relevant area then click on 'Aktuell' to see what's open at the moment. There's even a map of the village. Click on 'Search' then enter 'christophorus' and you will find where we stayed. It is a very nice chalet that is very close to the slopes so that, given all the snow we had, we could ski to and from the door. The owners live-in and keep the place spotless - definitely recommended. It's not even ten to four in the morning and here we are, assembling our wares in Manchester airport, in time for the 6:15 flight to Innsbruck. Security is a big issue these days and check-in is 2 hours minimum. Getting us all to the airport is always a problem. It turned out to be cheaper to pre-book with Premiere Parking than get a taxi each way - so that's what we did. The transfer at Innsbruck was handled quickly and we were soon on our way to St Anton. 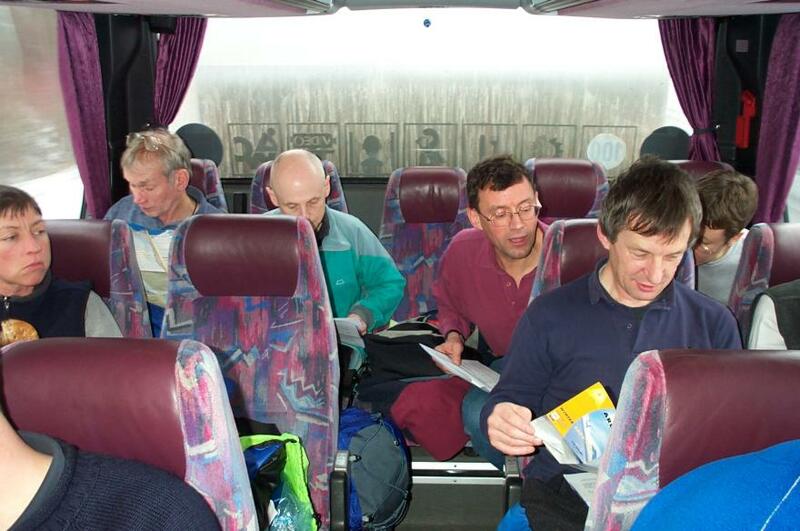 On the coach, the rep provided us with all the usual bumph including piste maps. We could also buy our lift passes using a credit card at no extra charge. The passes themselves are inductively powered smart-cards. All you have to do is pop it in your jacket pocket and leave it there all week. Our first example of Austrian efficiency - well done Arlberg. By 1:30 in the afternoon we were on the slopes, trying to get our bearings in the clag. I think this is at the top of the Mattun chair. A little later, and a little lower, we could see more of the valley. This is from the plateau at Gampen, looking over Galzig and towards St Christoph. 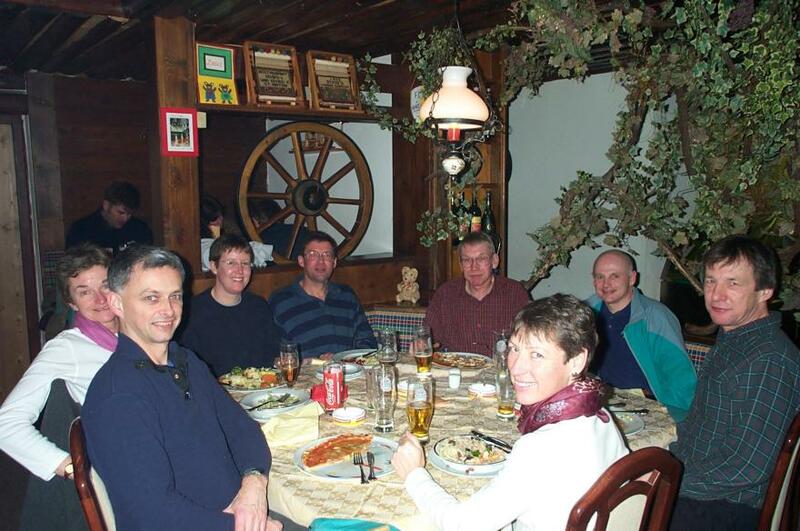 From left to right there's Andy, John T, Anne, Bridget, John M, Dave and Alison. All steamed up at our first Gluwein halt in the restaurant at Gampen. 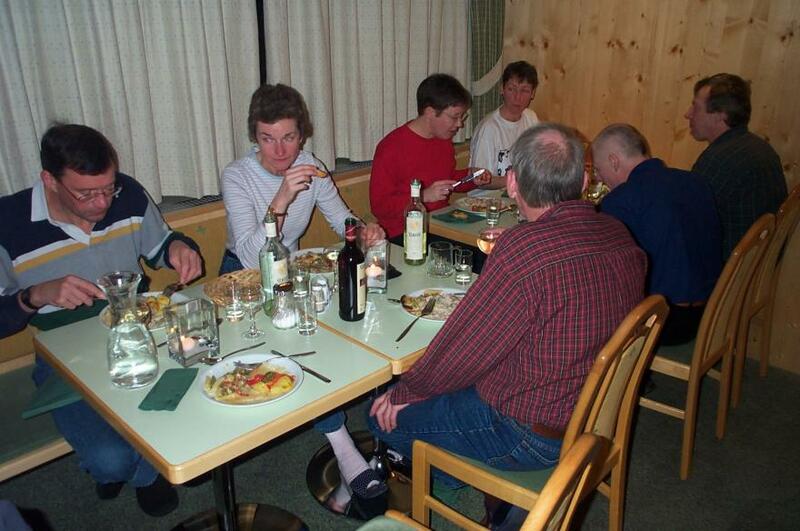 Many of the high mountain restaurants appear to be run by the lift company and are very tidy. When you flush a toilet there's even have a little arm that pops out to wipe the seat that rotates underneath it! 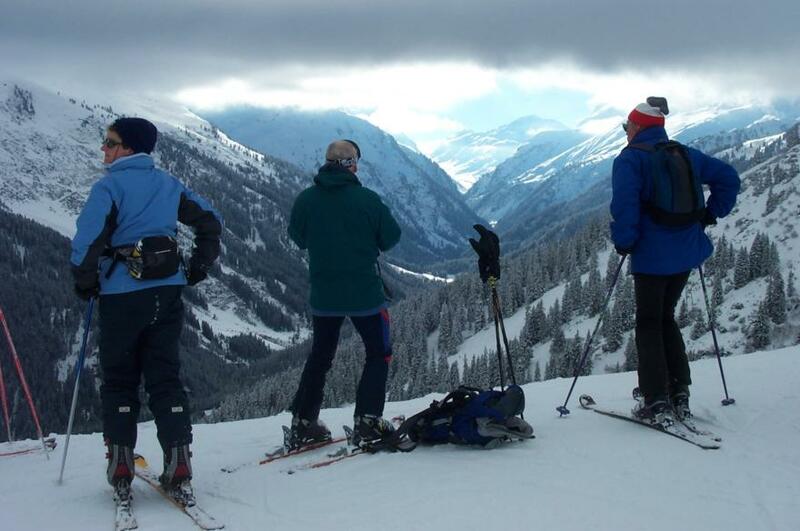 Sunday provided some clearer weather and we were able to ski all the way over to Stuben and back. 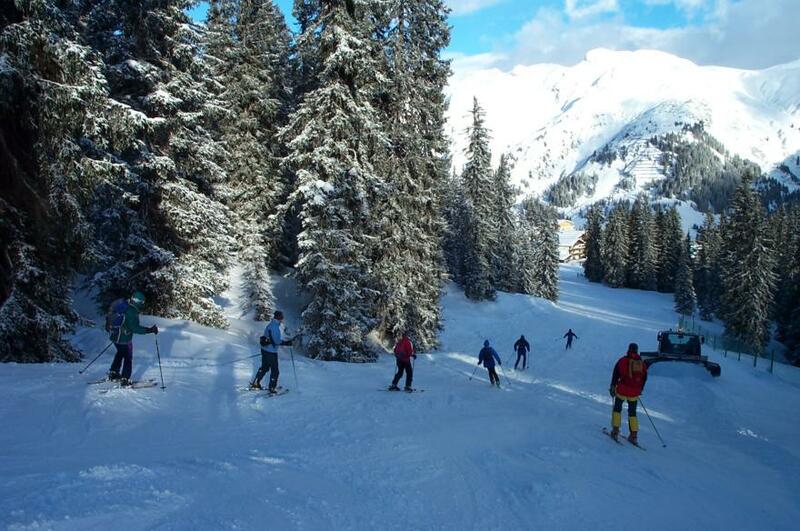 This included one of Europe's best 'long' runs all the way from the top of the Schindlergrat chair to Stuben. 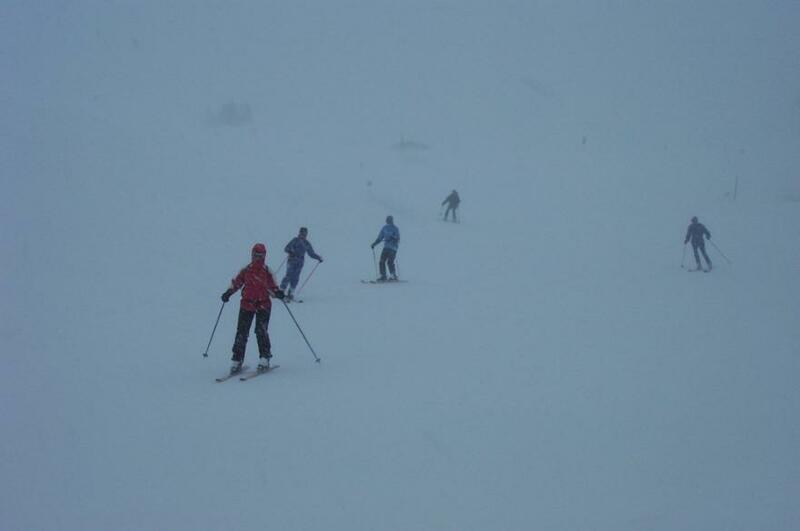 Unfortunately, we were so busy enjoying the skiing that I only managed to take one photo. 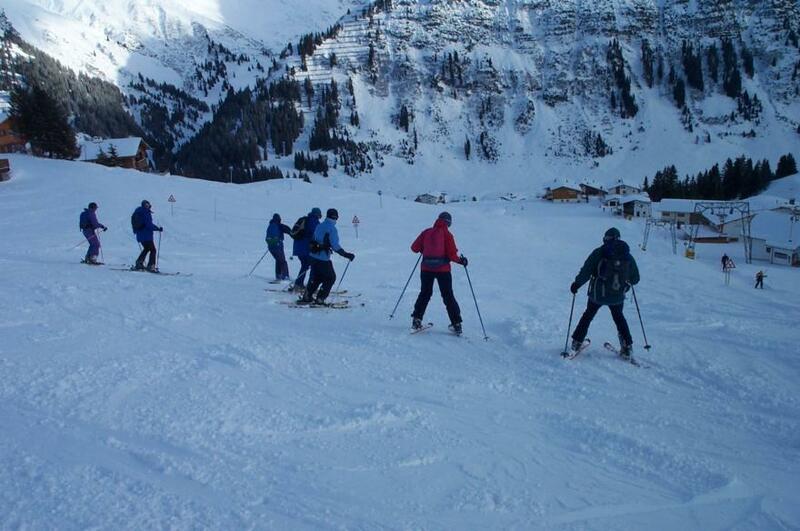 This is on the way back looking down Piste 4 towards Gampen. 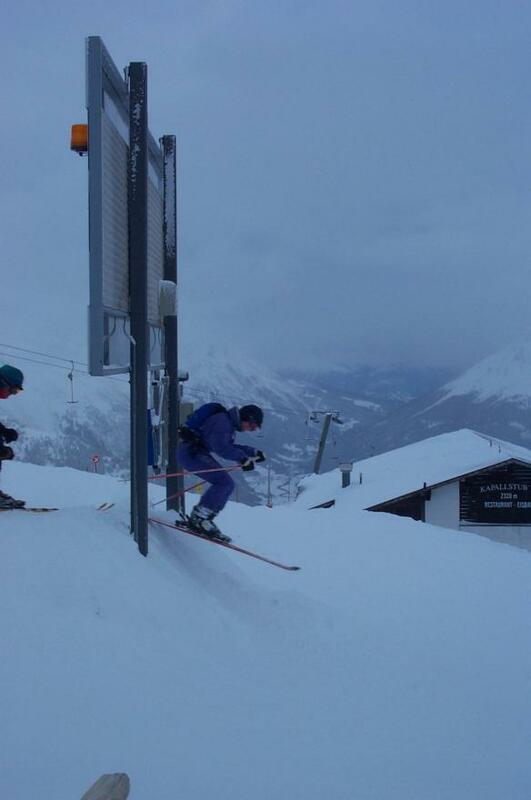 The skiing in St Anton is reputed to be difficult but this is one of the more unusual hazards. 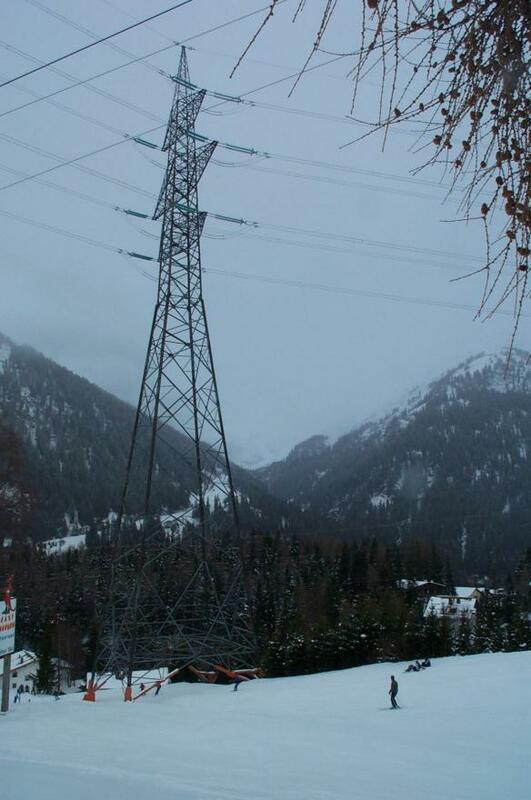 This pylon takes up half of Piste 1 on the way back into St Anton itself. 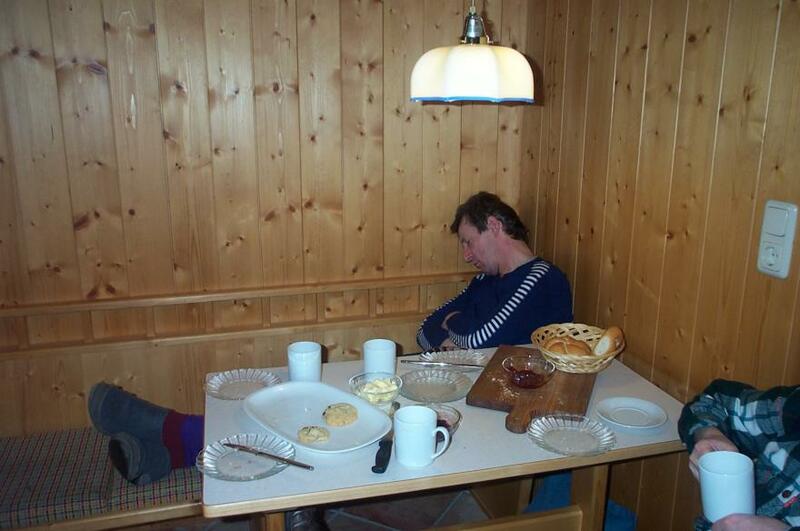 Most of the lifts close at 4:15 so by 5 o'clock we're back at the chalet for tea and a quick kip. 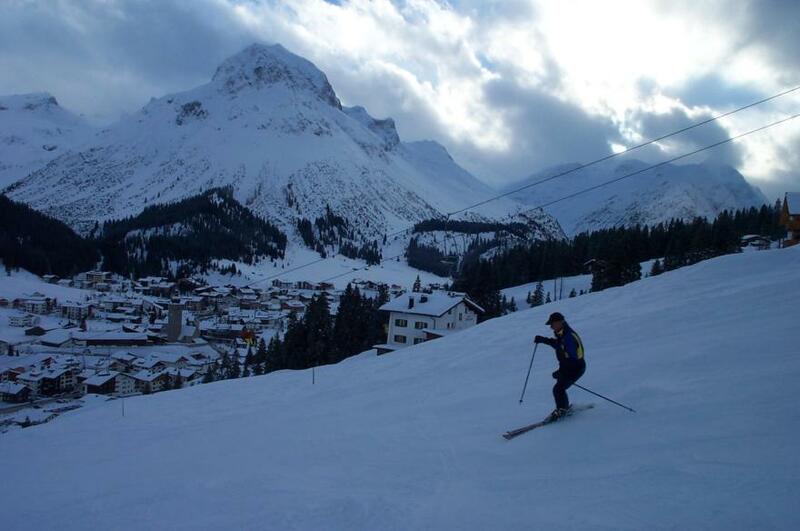 The Arlberg ski pass also covers the neighbouring resorts of Lech and Zurs. 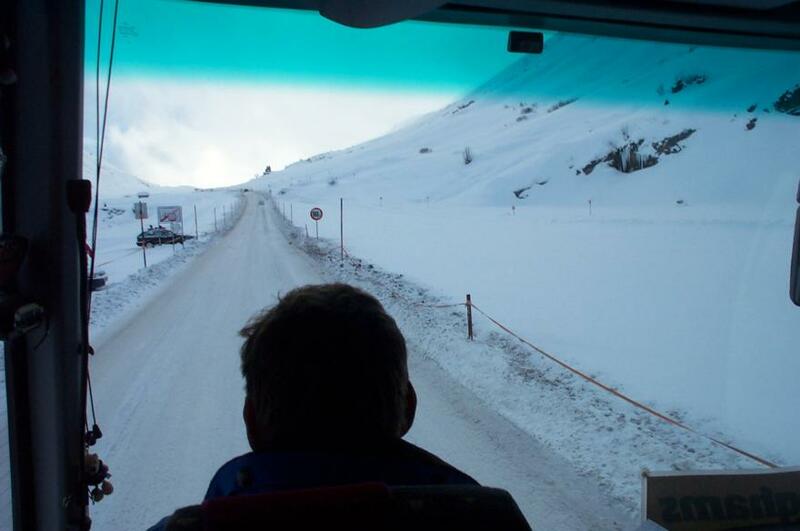 On Tuesday, Inghams organised a coach trip to Lech. We had hoped to do the classic tour of the two resorts but the weather was against us. In fact, because of high winds, only the lowest lifts were running for much of the day. 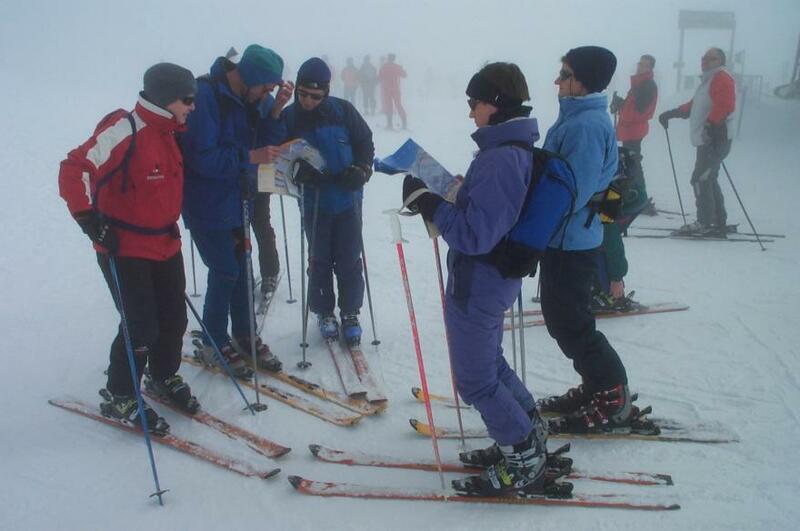 This is on Piste 62 where, a little earlier, we had gone the wrong way in the fog and had to tramp back up the slope. Suddenly, with about an hour to go, the wind dropped and the cloud lifted. 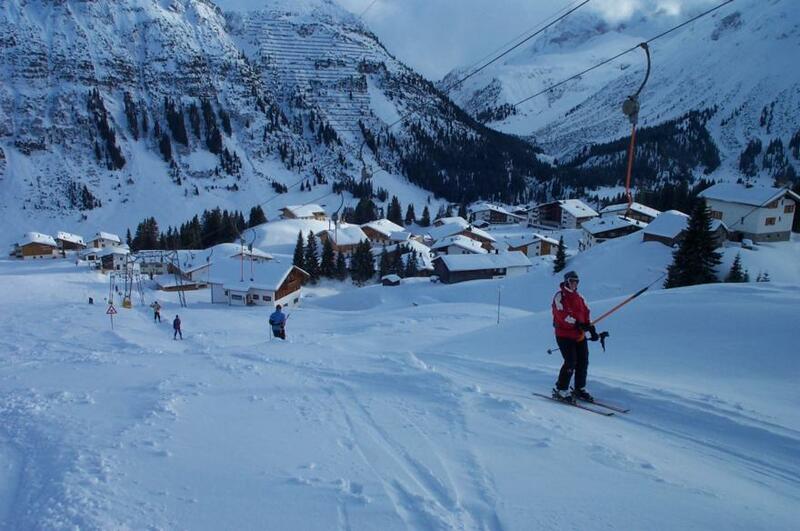 This is the red Piste that runs into Oberlech. Back again to Piste 62 and, this time, we were able to appreciate the full beauty of the resort. It's a pretty place and no wonder that it's a favourite of many celebs. There was just time to get in one extra ride on the Ubungslift while I took some snaps. Here's John M successfully filling my open rucksack with snow! 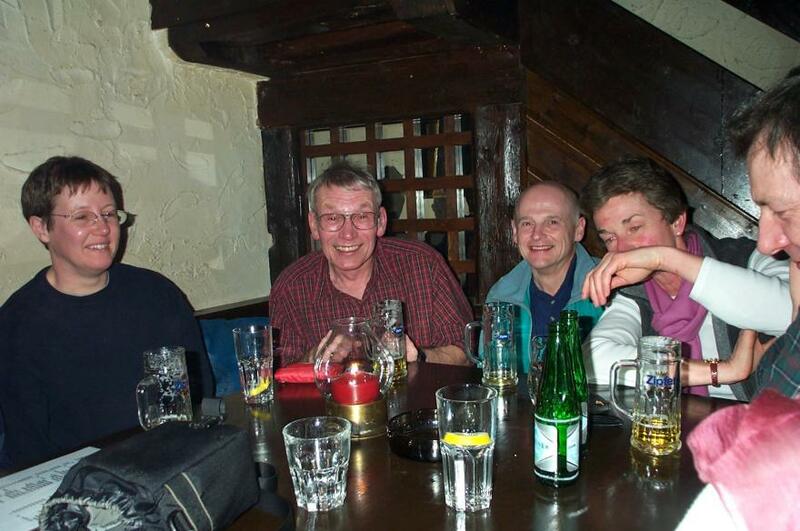 And Alison, John T, Dave and Bridget demonstrating their different styles. But the synchronised turns soon descend into chaos! A little further down, towards the waiting coach, and someone else demonstrates the nice 'Arlberg' style in front of the main village of Lech. While much of Britain grinds to a halt with a few inches of snow, the coach makes easy work of the Flexen Pass (1774m) with great banks of the stuff. It did have chains on mind. On the way down the other side we saw one car parked on a bend while the occupants had the instructions for theirs spread out on the bonnet - definitely not the place to learn how to do it! We spent Wednesday doing everything on Rendl. This is on the other side of the road to the main resort and offers some excellent skiing. This is at the bottom of Route R4a. Routes are not bashed or even patrolled but are marked with brightly coloured posts all the way and are one of the main reasons that we chose St Anton. Unfortunately, because of the avalanche risk, many of the more remote Routes were closed all week. 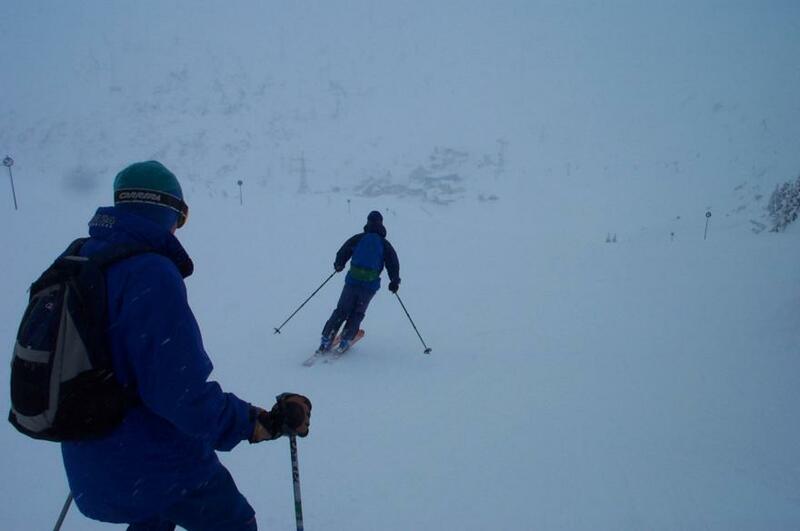 At ten in the morning the weather is still bad and we are still restricted to the lower runs. This is Piste 8 on the way down to St Christoph. In fact it's so cold (-16 Celsius) all day that we see few others on the slopes. Near the summit of Galzig (2085m) is a tower with some microwave dishes. I wouldn't fancy having to fix one of those on a day like this. Despite the cold, we still find things to amuse us. 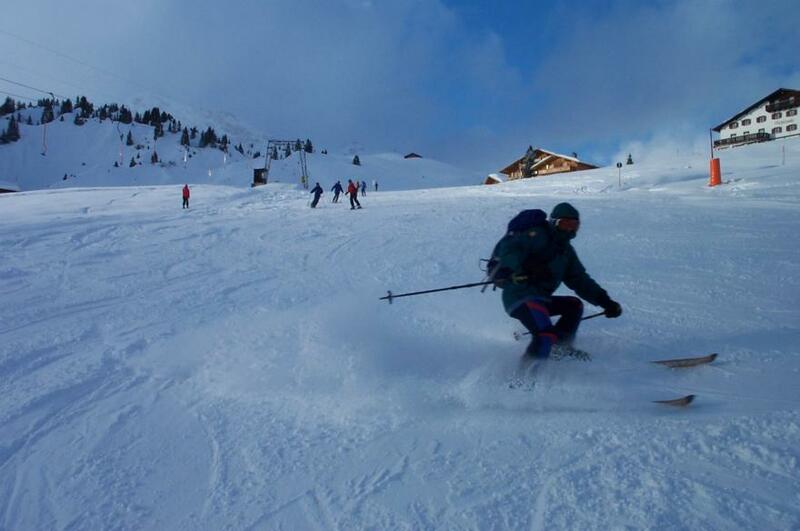 Here's Anne closely followed by Andy diving under the piste map at the top of Kapall (2330m) on the way to Piste 37. 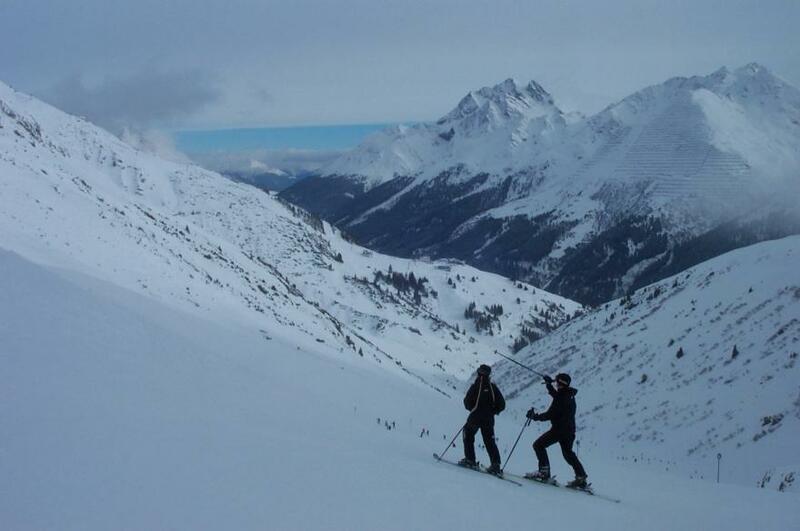 Although there is only one piste shown on the map it actually splits into two. The junction is difficult to spot so that one of them gets little traffic and had some fantastic snow. It was so good that we immediately went round and did it again. This time they squeezed through the gap side-by-side! ...before we go out for our evening meal. All the chalet staff have Thursday off so we have to fend for ourselves. This is in Dixie's Restaurant where, although it doesn't look like it, we have just finished our meal. The food is good and the portions enormous. 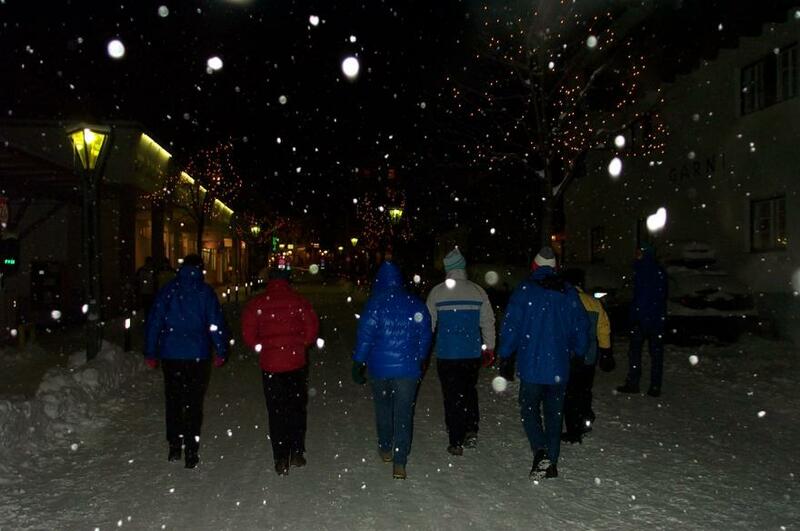 After dinner we tramp into town in search of a bar. It's still cold and snowing. We end up in Platz'l where 8 grown-ups amuse themselves for a good while watching a lemon pip go up and down in a glass of fizzy water. 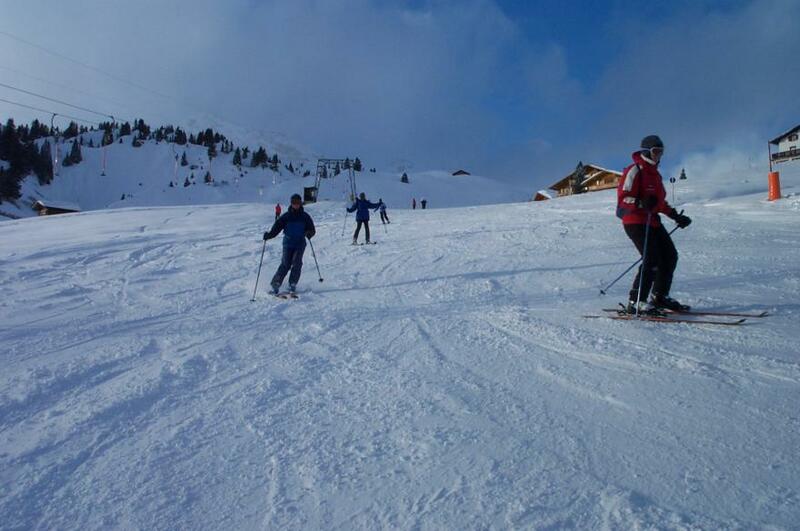 The weather clears and the slopes are visibly busier. 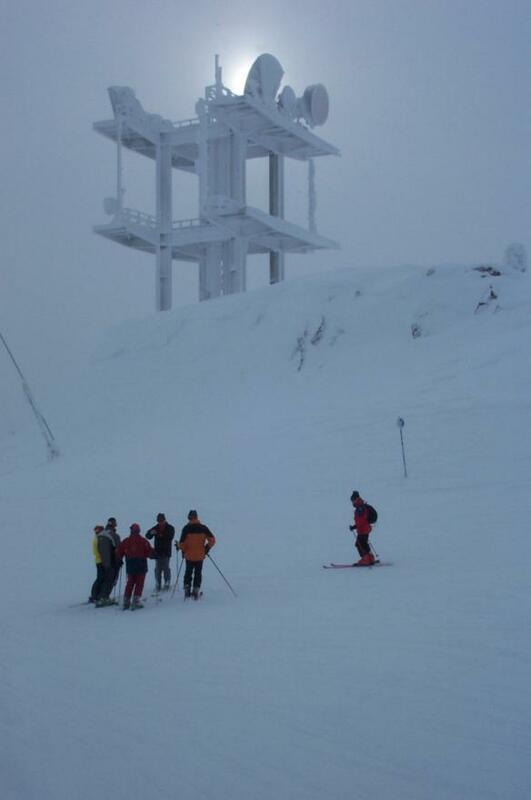 However, because of ice on the wires, many of the higher lifts are closed until late in the afternoon. 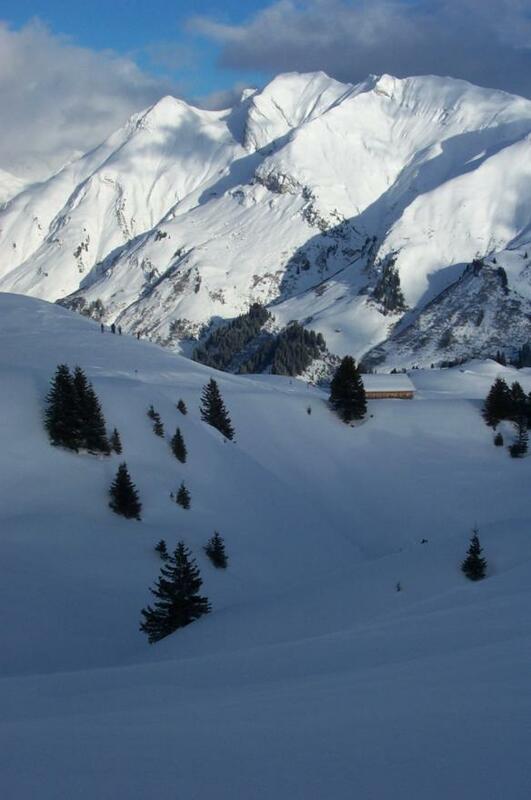 Most of the Routes remain closed because of the avalanche risk. We watch a helicopter drop bombs on the mountains above the Mattun valley. One of the resulting avalanches completely engulfs the markers of Route 33 - one of those that we really wanted to do. 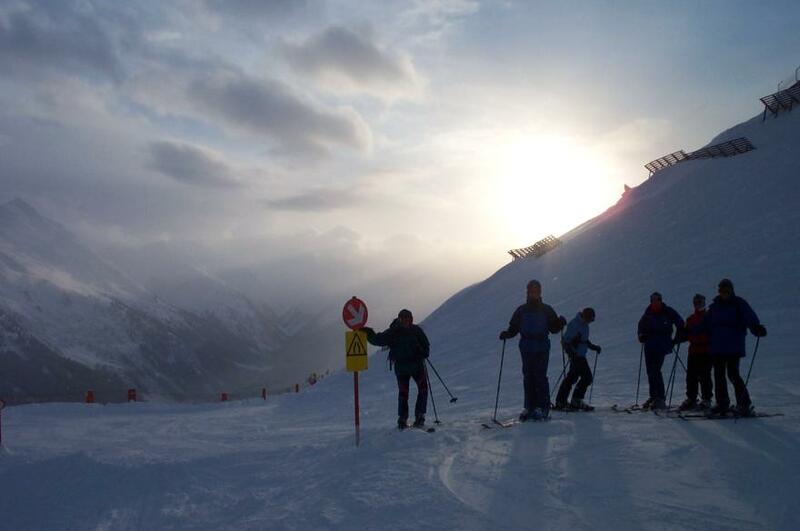 This is at 4:20 on the very last run of the holiday while the pisteurs wait patiently behind us. Dinner on the last day was a grand affair. 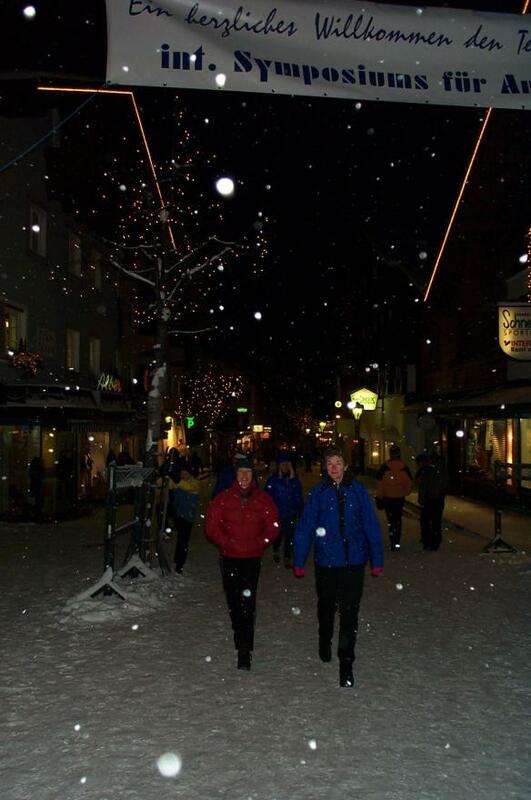 And last, but not least, are the excellent chalet staff, Kerry and Spence. 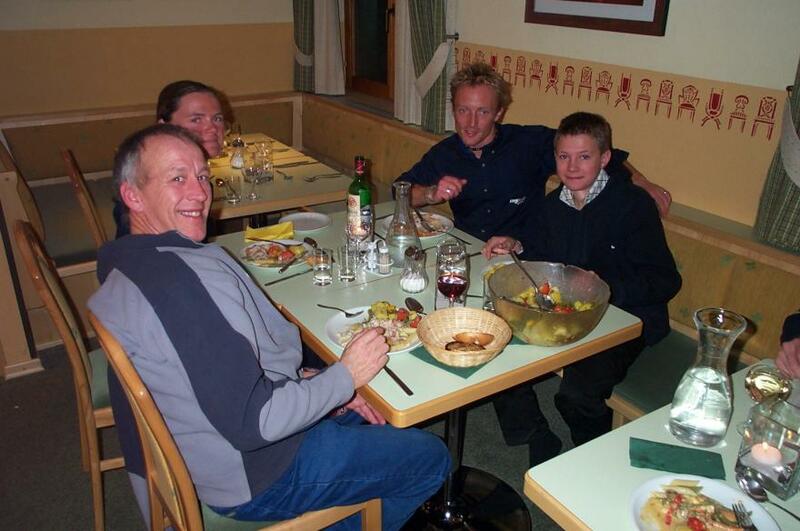 Kerry's dad, Viv, and younger brother, Sam, were also there for the week but sadly Viv had to stop snow-boarding on their second day after a high speed crash which seriously damaged his shoulder. The rest of us managed the week without any harm - even the 'technology' that I carried every day survived numerous tumbles. I kept my camera, wrapped in a fleece hat, inside a small rucksack and a PMR446 walkie-talkie (price per pair!) in my ski-suit pocket. My radio might have been useful the time I was separated from the rest of the group - only its partner was still in the chalet! The whole holiday went without a hitch - well nearly! On the way home the flight was delayed because of problems with the cargo doors. 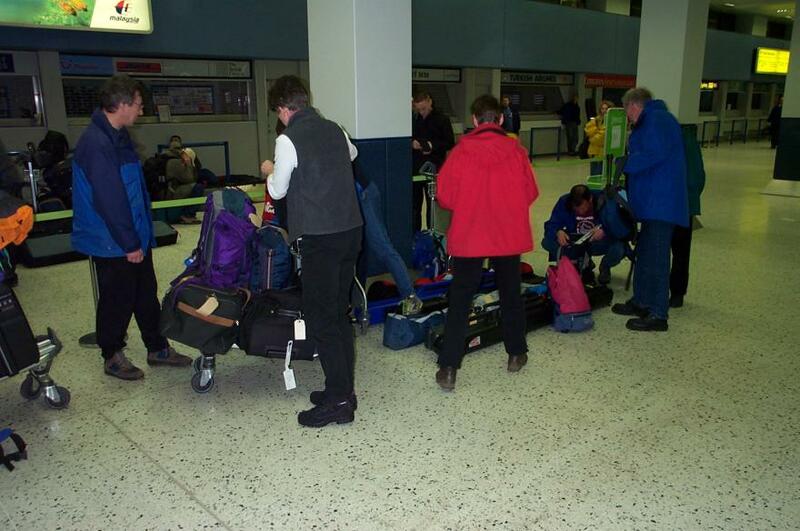 The flight crew pedaled hard so that we caught up most of the time but we still had to wait for nearly an hour at Manchester airport for our bags to re-appear. Also, there are 3 veggies in our group. Once again this information didn't reach the airline or the chalet staff before us.